For a turn-of-the-century look in your garden, some delightful — and available — antique flowers. An accomplished Midwest artist heads West to save his life. Reviewed by Advisory Board member Bruce Johnson. Chris Edker goes East to found a company and a new life. In beautiful Yosemite Valley, the most agreeable place to stay. Our writer tackles a long-neglected farmhouse. A neighborhood of shotgun bungalows — and famous personalities. 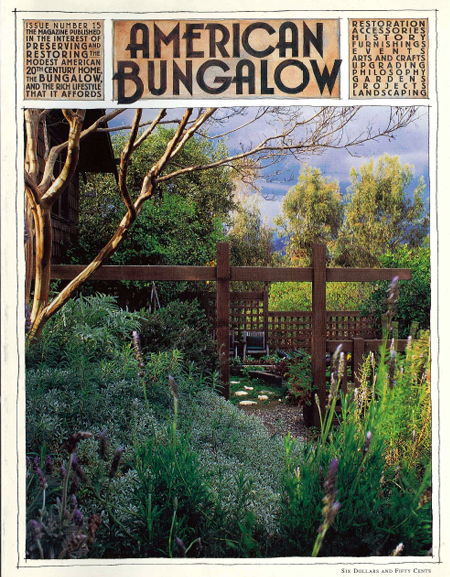 Searching for a word to define the bungalow’s architecture.